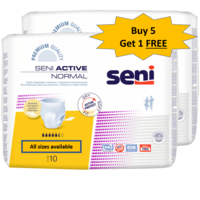 Breathable, elastic, disposable underwear type Seni Active Normal diaper is for moderate incontinence. 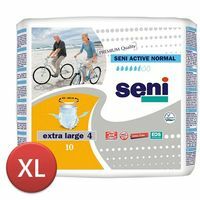 This diaper is to be worn just as a regular underwear is worn and is meant for people leading active lives or those participating in physical rehabilitation. The small size is for people with waist size between 55 cm - 85 cm ( 22" - 33"). The diaper has a vapour permeable outer layer which allows the skin to breathe easily. 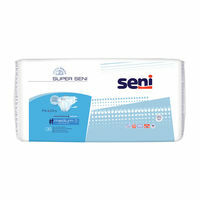 Contains an antibacterial superabsorbent that prevents unpleasant smells. Is shaped to ensure quick distribution of liquid so that the diaper remains dry. Completely latex free. 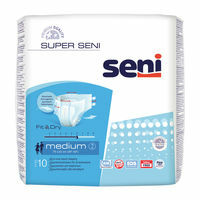 One of the most comfortable diapers available in the market. Light and discreet so no one will know you are even wearing a diaper. 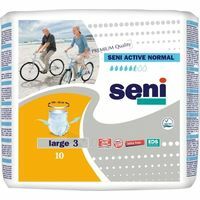 Breathable, elastic, disposable underwear type Seni Active Normal diaper is for moderate incontinence. 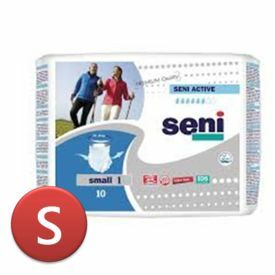 This diaper is to be worn just as a regular underwear is worn and is meant for people leading active lives or those participating in physical rehabilitation. The small size is for people with waist size between 55 cm - 85 cm ( 22" - 33"). The diaper has a vapour permeable outer layer which allows the skin to breathe easily. Contains an antibacterial superabsorbent that prevents unpleasant smells. Is shaped to ensure quick distribution of liquid so that the diaper remains dry. Completely latex free. One of the most comfortable diapers available in the market. Light and discreet so no one will know you are even wearing a diaper.